Posted on August 31, 2011, in Archives & Archivists, Council History and tagged council, exhibit, Georgia, LaGrange, Pine Valley. Bookmark the permalink. 2 Comments. I think the one that you have labelled as Adventurer is actually Troop Camper. Thanks so much for the comments. Our committee had fun looking this one up. We looked through several handbooks, and found our answer. 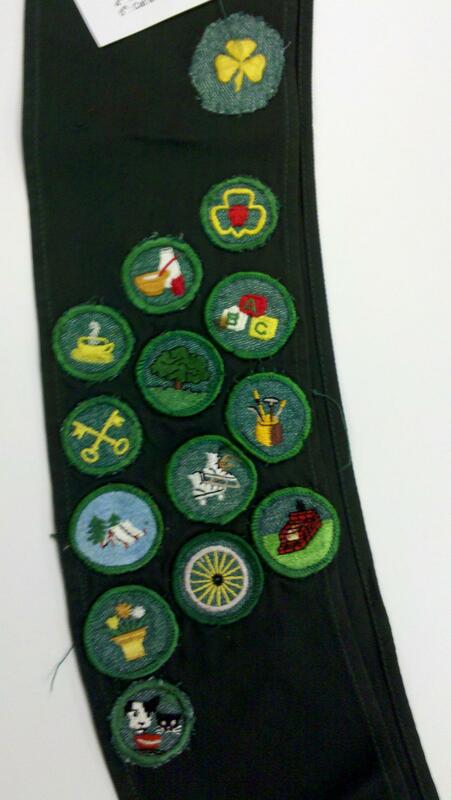 For the time period the sash is dated (1948-1962), the badge is called “Adventurer.” Starting in 1963, the name of the badge was changed to “Troop Camper.” I haven’t gone through to see how much the requirements changed, but perhaps that would be a good subject for a future blog post. Here are the books we used: 1) Girl Scout (Intermediate) Handbook, Girl Scouts of the USA, 1955. The requirements for Adventurer is on pages 446-447; 2) Junior Handbook, Girl Scouts of the USA, 1963. The requirements for Troop Camper is on page 359.